There’s no point in buying cool stuff if you’re not going to tinker with it. And some of that tinkering will likely cause it to break at one time or another. 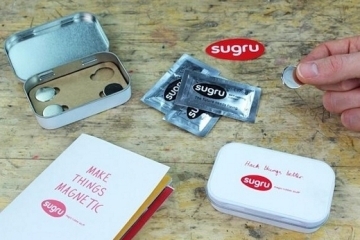 That’s why it’s smart to keep a stash of Sugru handy. Invented by former art student Jane Ni Dhulchaointigh (yes, I just copy-pasted that, too), the hacking putty is a clay-like compound that you can use as a go-to solution for a variety of problems. Yes, just like duct tape. Except it’s clay, so you can turn it into a whole host of wondrously ugly forms. Sugru is a revolutionary putty compound that bears a lot of resemblance to modeling clay — you know, those things you made animal figures with when you were a kid. Like clay, it can be molded into shapes. Unlike it, the material is self-adhesive, so you can use it to attach wood, metal, leather, plastic, rotting zombie flesh and more. After it cures in 24 hours, it will create a strong hold no different from super glue. Even better, though, it doesn’t harden. That means, you can use it to glue things that need to bend, such as shoes and alien skeleton joints. Not only that, it’s also waterproof (you can use it to patch leaks), temperature-resistant from -76°F to 356°F (you can use it to fix stuff that gets hot or cold), and dishwasher-safe (yep, for the Chopula you broke from too much use). 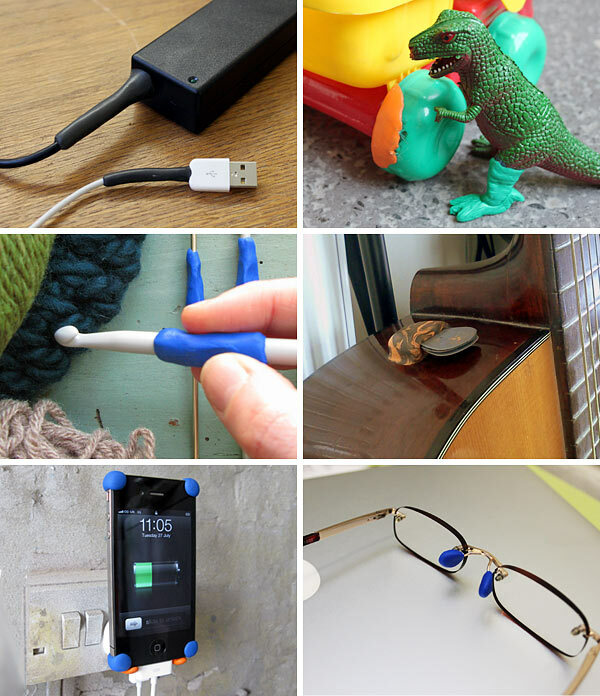 Aside from repairs, you can also use Sugru to add custom handles, hooks and other bits to your existing stuff to give them a whole new function. It’s available from Thinkgeek in packs of 12 (multiple colors), priced at $18. Very cool. This will be extremely handy around the house. What a relief for all those who are finding it tough to choose between curtailing the volcano of naughty energies emanating from their five year old child or saying sorry goodbyes to all their prices possessions that fell victim to the above mentioned energies! Sugru Hacking Putty sounds exactly what should placate such parents, as they can safely let their little devils tinker with the crockery and let all their worries be tackled by the strong hold of the Sugru Hacking Putty. And this might just be the saving grace for all you grown up freaks who can’t handle stuff without sending it tumbling down the floor. Long live the power to create, and longer live the power to mend those creations! So many times have I observed that in the race for being tagged as COOL, manufacturers let go of the most essential fabric that defines the goodness of a product, i.e., its utility. Thankfully, the Sugru Hacking Putty does not leave anything unattended to in that regard. Seriously, this stuff could do well in each and every household. Surely, we all have been mending and repairing our broken goods from many years now, but this sounds like an actually cool and easy alternative to the same, and might I add, there is some scope for creativity as well. 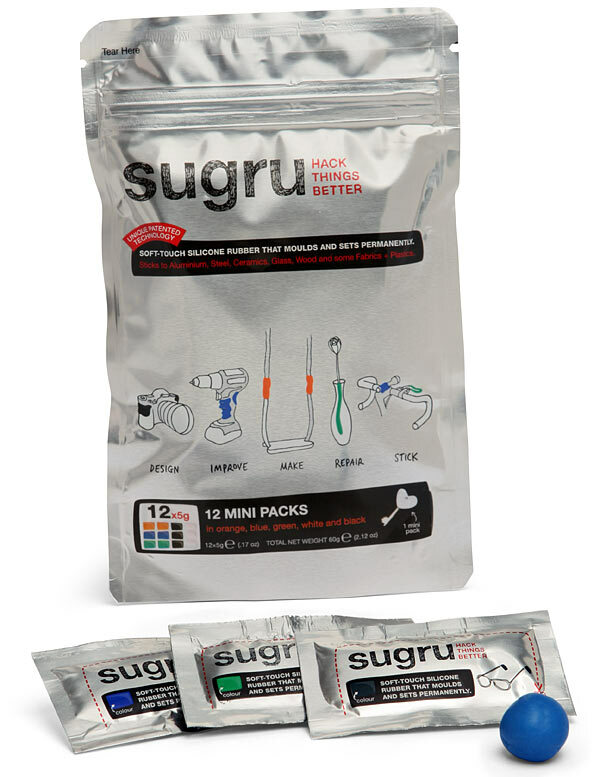 Hacking and repairing does become a lot more interesting when you have something as durable as this Sugru Hacking putty around, with as many as 12 different colors to choose from. With such an elaborate selection window, one wonders if the prime aim of launching this product is to cater to the creative interests or the household interests. And from the looks of all the reviews and articles floating around the World Wide Web pertaining to this cool contemporary product, it comes across as a superlative amalgamation of both. By God, the images are really impressive. I particularly like the idea of using this Sugru Hacking Putty to make the nose rests for the spectacle frame, though I would have chosen a shade of golden or yellow for the task, blue doesn’t quite complement the golden frame. Wow, I could easily make the twelve colors mix to yield dozens of new shades! And then to know that even after ‘hardening’ up (I can’t really think of any other word, though I know that it doesn’t actually harden) it remains flexible; this is right up there in the alley of all those creative minds looking to work on clay to exhibit their skills. And the best part is that it is such a high utility product that you could easily buy a couple of packs and tuck them up somewhere with the confidence that not much time would pass before you would revisit them for some help in mending something broken, or better still, to create something new altogether! What a wonderful product to possess, and at such a reasonable cost! I am really taken into this thing. It’s one thing repairing a broken article with something like a putty, and entirely a different story if you happen to have hold of the Sugru Hacking Putty. I mean, it makes the repair job look so professional, and almost ‘not a repair job’ at all! I would easily take the results of all these images as actual designed products rather than some manual concoctions of skill and putty. And to note that you get a pack of 12 different colors at just 18$, really, it’s a win win situation being a customer these days.